In this image taken from the Databank page for Tuanul we can see a stormtrooper with a cape in the background. Do we know what type of stormtrooper this is? It would not appear to be a snowtrooper as their long coats are generally form fitting and quite tight. 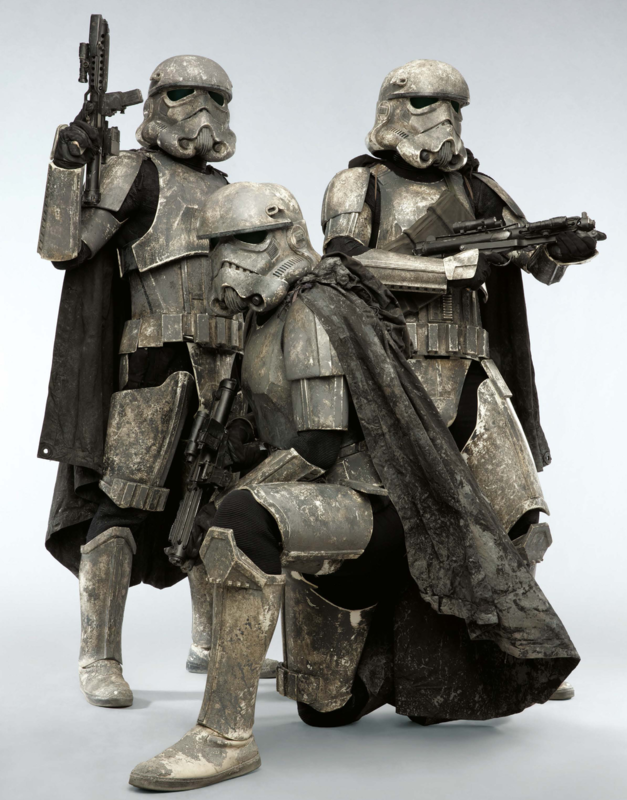 The Star Wars wikia also identifies a caped stormtrooper type as "Wet-weather gear stormtrooper" but these are from the Imperial era and first showed up in Solo: A Star Wars Story. That's not a cape on the stormtrooper, that's someone closer to the camera. 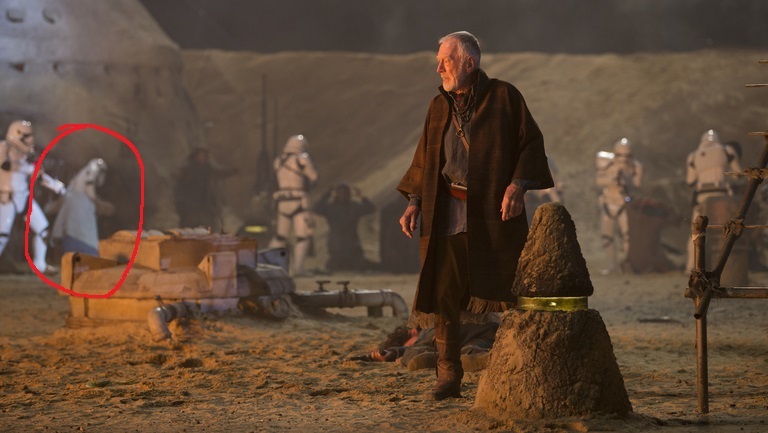 Note that the "cape" is not as out of focus as the trooper, indicating a different distance from the camera. And if you look, there's a distinct difference in colour: the light blue terminates abruptly against the white of the armour. Further, there are two projections out at either side. What you are looking at is someone wearing a light blue cloak over a grayish-brown top who is kneeling and slightly bent over. They have their arms raised and bent, just as the other prisoners in the scene do, but because they're bent over their forearms are more parallel to the ground (and thus not as obvious from that angle). 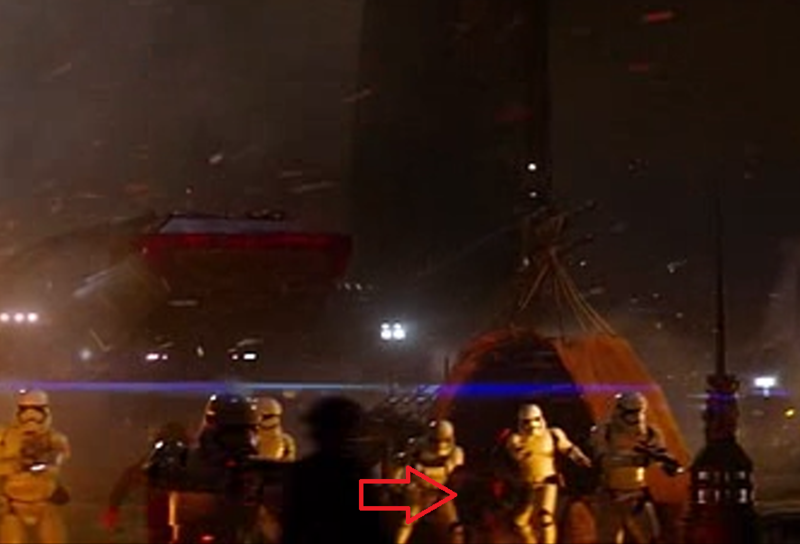 Note the trooper on the left: blaster in their right hand, and their left hand obviously on the shoulder of the kneeling person. This (00:06:22) appears to be the same scene viewed from a slightly different angle, possibly a second take(?). In it we see a First Order stormtrooper throwing a villager to the ground in front of him. The villager is wearing a voluminous grey/blue jacket (or possibly a blue dress) that billows slightly. Since we don't see any other cape-wearing stormtroopers exiting the shuttles, my instinct is that this isn't a cape but just something that was in front of the trooper at the moment the picture was taken. Not the answer you're looking for? Browse other questions tagged star-wars the-force-awakens character-identification or ask your own question. 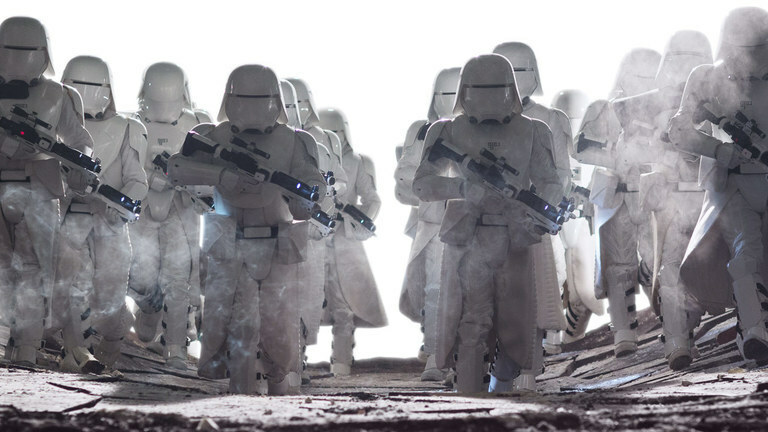 Did this stormtrooper in “The Force Awakens” have a name? Why was the Stormtrooper helmet designed this way? 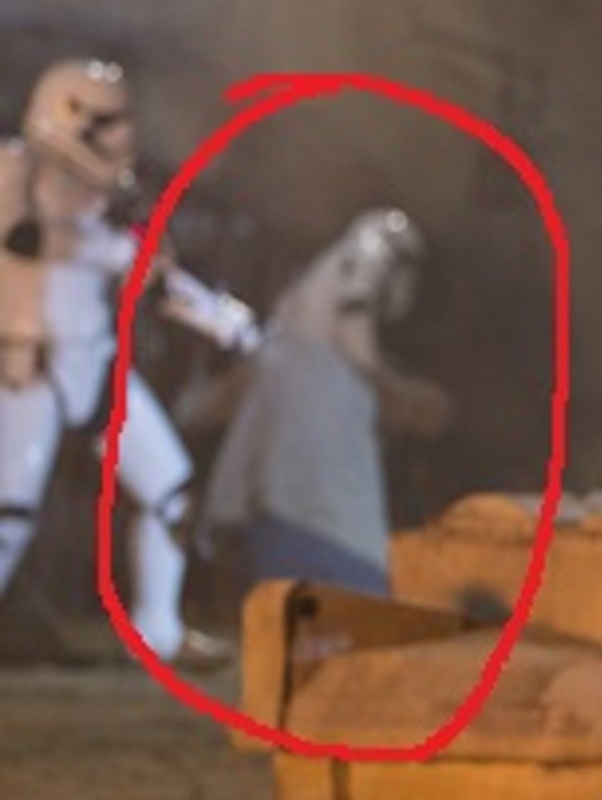 What was the weapon that this Stormtrooper used when he fought Finn? Was this Stormtrooper an idiot?